International Kidney potato seed is a Kidney shaped(who'd have guessed!) 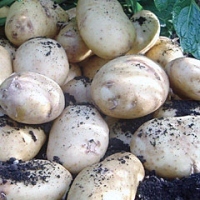 potato with pale yellow skin and pale yellow flesh which is waxy when young. When grown on Jersey is then marketed under the name 'Jersey Royal' - sold in supermarkets at a premium price probably, so grow your own. Bred by Robert Fenn of Berkshire (1879) an heritage variety sold early season. Although classed as an early maincrop let's clear up any confusion - when harvested prematurely it's a small firm waxy potato. Left to mature naturally it becomes kidney shaped and is floury enough to disintergrate slightly when boiled. Plant out in March and harvest in June. Pick prematurely for early or salad potatoes. Waxy potatoes are firmer and hold their shape. Floury potatoes are softer and break up more easily. 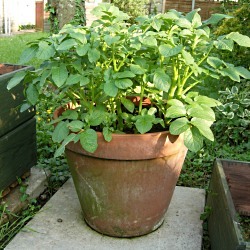 The potato varieties mentioned on this web site are suggestions only and there are many more available. The numbers given for pest or disease susceptibility or resistance are to be read as indicators. Factors like soil, crop maturity and skin thickness can affect the outcome of these readings - they are only a guide... don't get hung up.